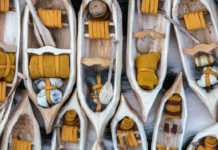 It’s true that money can help save weight with the latest and greatest gear, but there are much less expensive ways to do more on your canoe trip with less. Everyone knows that opting for a wafer-thin canoe and dehydrating meals can shave major pounds off your camp kit. So where is a burgeoning ultra-light canoe camper to focus their efforts next? 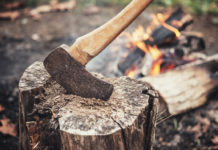 Let the famous words of Canadian bushcraft icon, Mors Kochanski, guide you to enlightenment: “The more you know, the less you carry.” Mastering campcraft skills means carrying fewer things—here’s how. The more familiar you are with your environment, the more resources you will have at hand. If there isn’t a fire ban and you know deadfall is accessible, go stoveless (a backpacker’s stove averages 14oz, plus fuel). Familiar with the local flora and fauna? Plan to supplement your diet with berries and other wild edibles, and bring only lures that are attractive to the local fish. Forage for birchbark or old man’s beard, leaving synthetic firestarters at home. 2) PLAN FOR MORE TIME EN ROUTE. Do this so fishing and foraging to supplement your carefully planned meals is enjoyable instead of stressful. With less weight in the boat and fewer items of gear to manage, you’ll make and break camp faster and cover more distance. 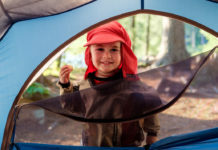 By stretching your explorations out over the day you’re less likely to notice the camp comforts left behind. Even lightweight and high-quality two-man tents typically weigh four pounds. Master your tarpology skills and strategy and you can continue to sleep dry in inclement weather for just over a pound in your pack. Buggy time of year? Take netting, a bivy or an enclosed hammock. 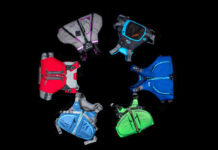 4) BRING GEAR THAT HAS MORE THAN ONE USE. Pre-trip organize the gear you want to bring into two piles; one of equipment that serves double duty and another of single-purpose tools. Now get creative. The carabiners in your pin kit can also be used in the bear hang. A bush knife makes sparks, kindling, fillets fish and preps food. Do you need the whole mess kit, or will a single pot and utensil do? Carefully cull from your pile of single-use items. By purchasing only high-quality, field- tested, lightweight and multi-use clothing and equipment you’ll save ounces upfront. You’ll save money in the long run because there’s no need to replace gear and garments each season. Opt for brands that promise warrenties on their products. The easiest way to cut down on pack weight is to leave things behind. If it needs batteries, do you really need it? Ditch the GPS (5oz+) and use a map and compass. The backs of maps are great for journaling. If you’re not guiding, do you really need communication devices (4oz+)? If you’re a skilled navigator sticking to your route, you will be found if anything waylays you, so long as you filed a detailed float plan. Learn how to signal for emergency help with items that don’t need batteries. Don’t pack for an apocalypse—bring only gear that can assist in emergencies you’re likely to face. Accept that what you might want in the moment is different than what you need. A few days of minimalism is good for the soul. 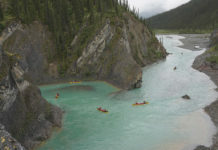 Laurel Archer is a 25-year canoe guiding veteran and writer of guidebooks for paddlers in Saskatchewan and British Columbia.